Madge declaring that with no groom and no water, the wedding is going to be a total disaster. MADGE: We've got no bridegroom, no water and the wedding is four hours away. Don't you *dare* tell me to calm down. HENRY: You are just lucky that I am too exhausted to *kill* you. HENRY: Harold, I have just spent the night in a stinking shed with two pigs, five chooks and not a stitch of clothing between us. When I say I want to kill him, I am saying it from the heart! JOE (laughs): I suppose saying sorry wouldn't help, eh? Henry goes to have a shower, but Madge tells him that there's no water in the street. Henry mutters that life just keeps getting better. Madge suggests that they ‘phone Paul: he might be able to lend them a couple of rooms at Lassiter's so that they could at least have showers – although that won't help with the reception. Joe says *he* might have a way of getting them a bathful of water – but he's going to need some help. With that, Joe leads Harold out through the front door. Henry announces that he's going to get into the pool: he'll be the one at the wedding smelling of chlorine! TOBY: It's not for games, it's for the bathtub. 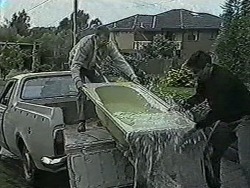 See, once it's got water in it, it's going to be real heavy, right? HAROLD (tersely): I'm aware of that. TOBY: Well, I thought instead of carrying it, you could put it on the skateboard and just *wheel* it along. DES: Something about pigs and dirt! Des adds that Paul said he's got some rooms at Lassiter's so everyone can have a shower. Bronwyn, Sharon and Kerry are all in the house and exclaim that that's great! Des says he'll drop them off now, and he heads to the door. He opens it and looks surprised to find Gordon Davies standing there. Mr. Davies asks if his daughter's there. Bronwyn and Sharon both run to the door and Mr. Davies tells Bronwyn that they've got to talk. Bronwyn tells Sharon and Kerry to go with Des and she'll get a lift with their dad. Des, Sharon and Kerry head out. 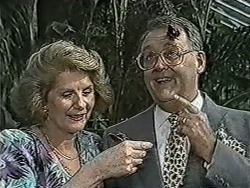 Bronwyn tells her father that she'll just get the mess off her hands from Sharon's face mask. JIM: Now *that* I know how to use! MADGE: Honestly – if I'd known that weddings were going to be such trouble, I'd never have had kids! MADGE: Hardly a drop. Anyway, Harold and Joe have gone out to get some. Don't ask me how, but Joe says he knows a way. JIM (muses): I wouldn't hold my breath! BRONWYN: Dad, this is my wedding day. Please don't ruin it. MR. DAVIES: I'm more concerned you're going to ruin your *life*. BRONWYN: Dad, *don't*. If you don't want to come to the wedding, well, OK, but you can't stop it. BRONWYN: Henry and I have been together for *ages*. MR. DAVIES: Once you're married, you can't just walk away if it goes sour, you know? BRONWYN: We won't. We love each other too much. MR. DAVIES: You've been in love before, Bron. You got engaged – and you were very glad when you *didn't* marry that young man. MR. DAVIES: Look, all I'm asking is not to rush into it before I even know Henry *properly*. I worry for you, Bron. I couldn't sleep last night for thinking about it; and you weren't going to get married until next year. What's the mad panic to do it *now*? BRONWYN: It just all worked out for us to take over from Des and Jane. MR. DAVIES: That isn't much of a reason. You're both so young... and doesn't it concern you that Henry's so immature sometimes? I mean, is he ready to be a husband? And perhaps, a bit later, a father? BRONWYN: He knows he's got some growing-up to do. MR. DAVIES: Well why not let him do it first? Look, just put it off for a few months; give me time to get to *know* the boy. You could both come up to Narrabri and stay with me and your brother. BRONWYN: No... what difference will *that* make? 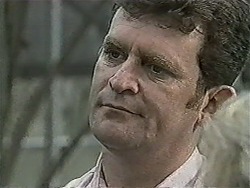 MR. DAVIES: It'll give me a chance to get to know this other side you say there is to Henry. I love you, Bron, and if you love *me* you'll do this for me, just to give me some peace of mind. HAROLD: You see? I told you, and I was right. 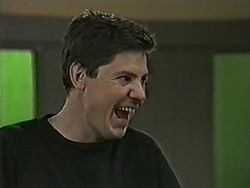 JOE (retorts in annoyance): You're *always* right. The two of them have let go of the bath as they bicker, and it suddenly starts rolling down the sloped driveway and heads for the street. 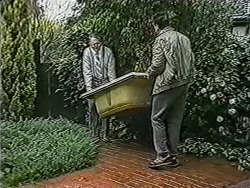 Joe and Harold chase after it, but it's no good: as the bath goes over the kerb, it tips over, spilling the rest of the water into the road! BRONWYN: I've got to talk to you about something. I want you to be really understanding. The guests are gathered at the Butterfly House at the zoo. Joe is standing in front of the celebrant, telling him that there's been another slight change of plan: *he's* the only bridegroom now. Henry is standing next to Joe and Joe tells the celebrant that Henry's going to be his Best Man. CELEBRANT: We are gathered here for this very happy occasion: the marriage of Joe and Kerry. JOE: I'm truly honoured that someone as beautiful as you would be my wife and share your life with me – and I'll always be there when you need me. From me and Toby... thank you. We'll always love you. KERRY: I promise to open my heart to love and bring all the warmth and happiness I can to this union. 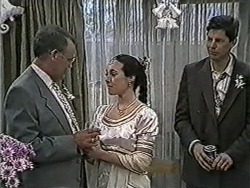 Joe places the ring on Kerry's finger as Bronwyn looks on sadly. Kerry places the ring on Joe's finger as Harold watches her proudly. Bronwyn bursts into tears. Des watches, clearly wishing *he* was getting married instead. 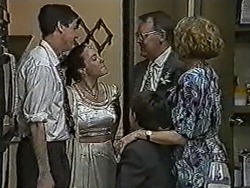 The celebrant then tells Joe and Kerry that they can kiss each other. Joe pushes back Kerry's veil and kisses her passionately as those gathered burst into applause. HENRY: Well, I guess I can wait six months if it makes Gordy happy! BRONWYN: Yeah. We're leaving first thing in the morning for a week or so in Narrabri. HENRY: And I am *determined* to show Gordon that I'm the right man for Bron. Nothing can stop me! HENRY: Three cheers for the Water Board! Everyone joins in with the Hip Hip Hoorays! Madge turns the water off! Des is standing on his own in No. 28. He goes and picks up Daphne's jewellery box from the shelves and he goes and sits down and stares at it. He opens the lid and it starts playing its tinkly tune. He then lifts out two rings from inside and looks at them sadly as he thinks about Jane. 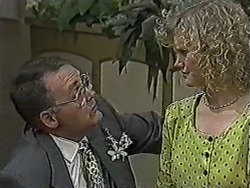 HAROLD: Kerry, there was a time there when we were little more than strangers, eh? It was my fault, of course, because I thought I wanted a different daughter. And then, of course, Henry made me realise that that was exactly what I *did* have: a very beautiful young lady who was refreshingly different. I will be eternally grateful that I was allowed to get to know her. KERRY (warmly): That goes both ways, dad. HAROLD: If your mother were alive today, I just know that she'd be as proud of you as I am. Now, as for Joe, well, I know that he's going to do everything in his power to make you happy. 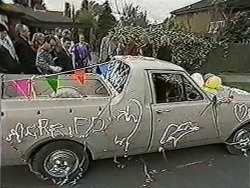 HAROLD: As you all know, it was to be *their* wedding day today, but, at the request of Bronwyn's father, they have agreed to delay their wedding for a couple of months – and in agreeing to do this, well, it made me realise what a caring, loving and mature young couple they really are. 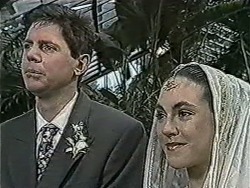 I know we all look forward to *their* wedding day, eh? JOE: Well, look, I suppose I don't need notes to say I'm the luckiest bloke alive. HAROLD (softly): Indeed you are. HENRY: Good on you, Joe. A short time later, Joe and Kerry cut the cake as everyone lets out another round of Hip Hip Hooray! Joe and Kerry kiss passionately in front of everyone and, as he breaks away, Joe chuckles as he asks the guests to go away! SHARON: I was just thinking about my mum. *She* would've talked dad around. I wish she were here. HAROLD: Well, do you know something? I wouldn't be a bit surprised if she *was* – along with Kerry's mother. They're both here somewhere, looking at the whole thing with all of us. HAROLD: I'm glad you think so, Joe, because there's something *else* we'd like to do for you. Now, I know you can't afford a honeymoon just yet, and I hope you don't think this is presumptuous, Joe, but we have arranged for you to have a long weekend at Green Valley Lodge. That's where Madge and *I* spent our honeymoon. Madge adds that *they'll* look after Toby and Sky. Kerry and Joe both thank Harold and Madge gratefully. HENRY: It won't be long. BRONWYN: You know I love you. BRONWYN: And you know I wanted to marry you today. BRONWYN (cries): I'm sorry, Henry – I didn't know what to do. I love my father too. HENRY: Look, you did the right thing. We're still together and... it can wait. It'll happen for us. With that, Henry and Bronwyn hug tightly. KERRY: ‘Thank you' just doesn't seem enough. MADGE: I'd say it's *more* than enough. You have a good time. Bronwyn nods her head and then turns and gives Henry a passionate kiss. Tears fall from her eyes again, though, as she then leans her head on his shoulder.